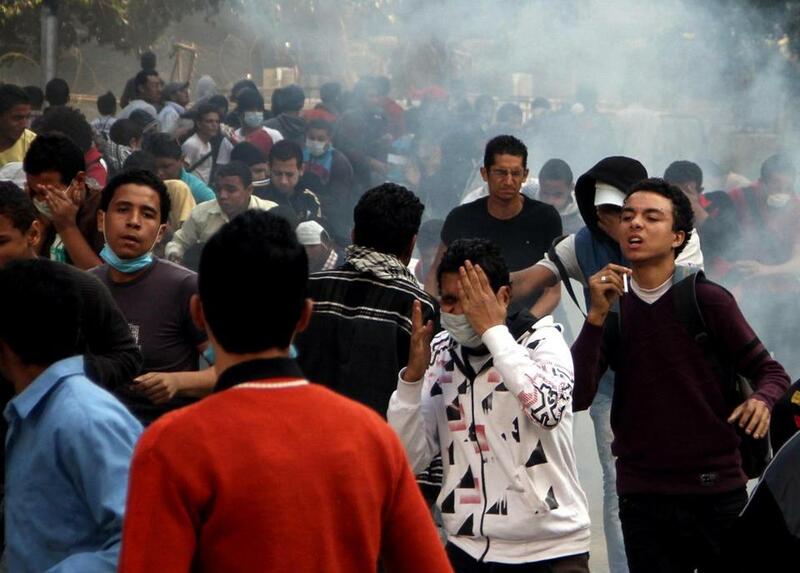 Egyptian protesters clashed with security forces near Tahrir Square in Cairo. CAIRO — New cracks emerged in the government of President Mohammed Morsi of Egypt on Sunday over his decree claiming power beyond the review of any court in the country, which has been met with loud protests. While Morsi defended his decree and insisted that it was only temporary, his justice minister began arguing publicly for a retreat that might defuse an escalating battle between Egypt’s new Islamist leaders and the institutions of its old secular-authoritarian government. The justice minister, Ahmed Mekki, is an influential former leader of the movement for judicial independence under Hosni Mubarak, and is now one of Morsi’s closest advisers. He told two television talk shows late Saturday night that he objected to the scope of the president’s decree, which his opponents say could be a first step toward a new Islamist autocracy. The president’s office has said the decree was needed to protect the democratically chosen constituent assembly that is trying to write a new Egyptian Constitution from Mubarak-appointed judges who appeared poised to dissolve it. Mekki said that he supported that goal but that the president could accomplish it with a much narrower edict — one that did not assert sweeping immunity from judicial review on other matters, the feature of the decree Morsi issued on Thursday that has prompted the loudest protests. On Sunday, Mekki met with the highest council overseeing the Egyptian courts to discuss the matter, and the council issued a statement of its own that scholars said appeared to endorse Mekki’s proposed compromise. Morsi is scheduled to meet with his advisers to discuss it Tuesday morning. Morsi, Egypt’s first freely elected president and a former leader of the Muslim Brotherhood, now faces a test of his ability and willingness to engage in the kind of compromise that democratic government requires. But he also faces real doubts about the willingness of his secular-minded opponents to join him in compromise. Each side is mired in suspicion of the other, a legacy of the decades when the Brotherhood survived here only as an insular secret society, demonized as dangerous radicals by most of the Egyptian elite. Some conflicting signals emerged Sunday from people close to the president, while street protests continued in Cairo and Egypt’s stock market fell sharply, driven by investors’ concerns about increased instability. The president’s office issued a statement stressing that the decree was meant to last only until the country approves a new constitution, and that Morsi was committed to reaching a national consensus on what that new constitution should say. A spokesman for Morsi’s Freedom and Justice Party, though, insisted that the president would never back down from the decree, arguing that the constituent assembly working on the constitution needed protection both from Mubarak-era judges and from obstructionist political opponents who want to drag out Egypt’s transition. The first attempt to form a constitutional assembly was annulled by judges, and the latest version has been plagued by complaints that the Islamists who dominate it were rushing through the work and ignoring minority concerns. Mekki, the justice minister, said he trusted Morsi’s intention to quickly end Egypt’s tortured political transition, bring back a Parliament and turn over the vast power he currently holds. ‘‘But the means, the tools and the wording caused exactly the opposite of what was required,’’ the justice minister said, urging Morsi to amend the decree. The decree’s sweeping nature, insulating all the president’s actions from judicial oversight at a time when, after the Parliament was shut down by the courts, he wields legislative as well as executive power, prompted at least three presidential advisers to resign: Samir Morqos, one of the few Christians in the administration; Sekina Fouad, one of the few women; and Farouk Guweida, a poet and intellectual. On Saturday, judges across Egypt rebelled against the decree, and a major association of judges, the Judges Club, called for a judicial strike. State television reported Sunday that Mekki was meeting with judges in Cairo in an attempt to broker a resolution. A coalition of opposition leaders, including the former United Nations diplomat Mohamed ElBaradei and three other former Egyptian presidential candidates, demanded that the decree be canceled. On the first day of trading since the decree was issued, Egypt’s stock market fell about 9.5 percent over concerns that the latest standoff could bring more instability. Clashes involving the opposition were reported Sunday in Cairo for a third day, and the Muslim Brotherhood has called for rival demonstrations, raising the possibility of street fights between the two sides.